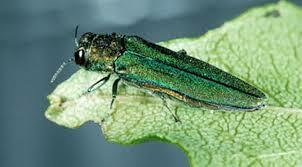 Emerald Ash Borer (EAB) is an invasive pest that is believed to have been introduced to North America from Asia. The feeding activity of the larval stages of the EAB destroys the conducting tissues of the tree leading to rapid decline and death of infested trees. The insect has devastated populations of Ash trees as it has spread across the continent. Ash trees make up roughly a third of the urban forest in Winnipeg and are greatly threatened by the arrival of this insect invader. There are 2 products that can be injected into your trees to protect them from the borer please, contact TNT Tree to discuss treatment options. TNT Tree can also work with owners and property managers to develop management plans encompassing, treatment, removal and/or replacement of your Ash trees. The goal of all our plans is to allow cost effective management of the infestation while minimizing the risk potential posed by trees killed by the Emerald Ash Borer.